You can get the matching segments from Gedmatch, MyHeritage, 23andme and/or Family Tree DNA. In future it's anticipated that other vendors will provide this information. Gedmatch Genesis, MyHeritage and Family Tree DNA accept transfer uploads of autosomal DNA test results. If you haven't already, consider uploading your DNA to these sites in order to find more matches. Or alternatively, click on 'one-to-many'. This will bring up a table of matches, with the closest at the top. To get the segment data for an individual match, click the 'A' to the left of the match name. This will bring up the one to one comparison tool with the kit numbers pre-filled. 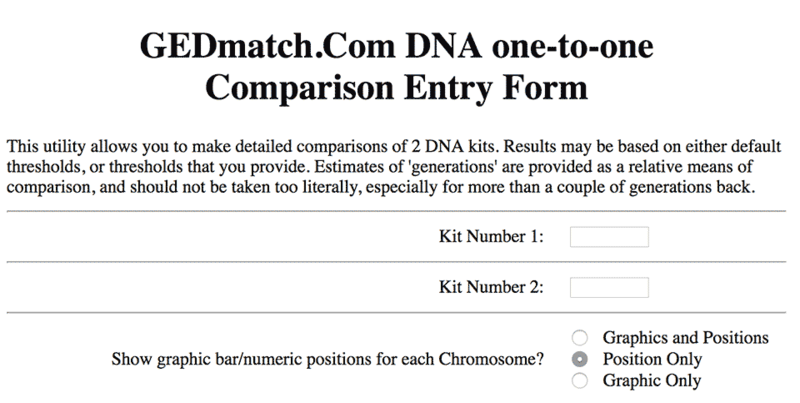 Please note that in Gedmatch Genesis, X-DNA matches are compared separately from autosomal matches. A separate one-to-one tool exists for X matches. Gedmatch (http://www.gedmatch.com) also uses kit numbers. If you know the kit number of the match, you can go straight to the 'One-to-one' compare tool. Enter your kit number in the 'Kit Number 1' box and the other kit number in the 'Kit Number 2' box, and click the submit button. The results look like the picture below. You can copy and paste the table data (it doesn't matter if you include the header or other data as well) straight into the 'Paint a new match' form. Option 1: Click 'Review DNA match' on the match you're interested in so that you can access the segment data. On the detail page, scroll down to the chromosome browser at the bottom of the page (please note - you might need to be on a desktop device in order to see this section). If you click 'Advanced Options' at the top right of this table, a link to 'Download shared DNA info' appears. If you click this link, a file will download containing the match segments. You can paste the contents of this file (either comma delimited as it comes, or after opening in a spreadsheet programme such as Excel) into the 'Paint a new match' form on the DNA Painter site. Option 2: Go to the Chromosome Browser and select yourself and your match. At the bottom of the page you'll see a section called 'Shared segments info' with a table of data that you can paste into DNA Painter. 23andme matches are under Family & Friends > DNA Relatives. You can't transfer your DNA to 23andme; you have to have done one of their tests. To get the segment data, you have to either click 'Download aggregate data' for a spreadsheet of all segments, or go to the DNA Comparison view at https://you.23andme.com/tools/relatives/dna/. After you click a match to compare, the segment data will appear in a table at the bottom of the page, which you can paste into the 'Paint a new match' tool in DNA Painter. You can also import segments from 23andme that correspond with ethnicity estimates. To do this, visit this page and click 'Download Raw Data'. These segments can then be imported via the 'import ethnicity' tool. 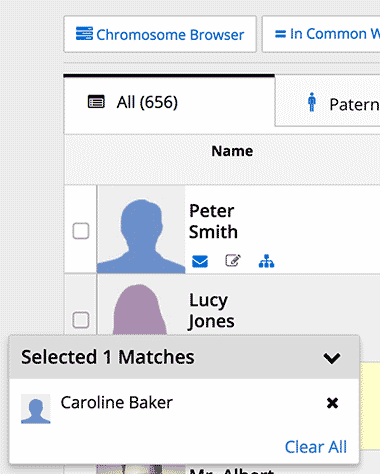 If you've tested with Family Tree DNA or completed an autosomal transfer, you can view your Family Finder Matches at https://www.familytreedna.com/my/familyfinder/. Tick the checkbox to the left of the match you're interested in, and click the 'Chromosome Browser' button. If you click 'Compare', you'll be taken to a page showing the chromosomes and a graphical representation of the DNA you share. If you click 'Detailed Segment Data', above the chromosomes, you'll see a table. You can copy and paste the segment directly into the DNA Painter 'Paint a new match' form, or if you prefer, you can click 'Download segments' for a CSV file, which you can then copy and paste into the same form. It's worth noting that Family Tree DNA include even very small segments in their data. Many geneaologists disregard these small (less than 7cM) segments as they might be coincidences rather than genuine matches. If you're not sure, you can keep the small matches and delete them from your profile later. The nice thing about painting them is that any overlapping or proximity to other matches will be obvious. You can copy and paste this data directly into the 'Paint a new match' form, or if you prefer, you can download the Excel file and paste in columns 3-7 (starting with Chromosome and ending with SNPs).